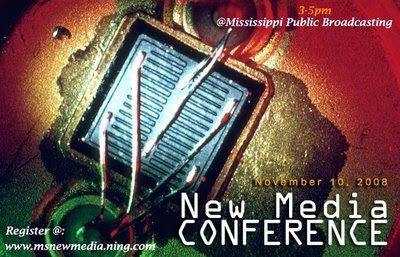 On Nov.10th from 3-5pm there will be a New Media Conference at the Mississippi Public Broadcasting Auditorium. 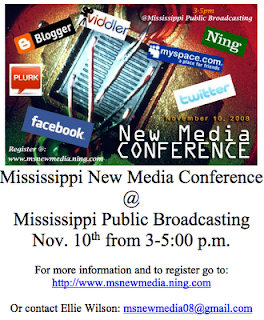 The conference will cover the topics of new media in education, new media in PR/Marketing, and social media tools. There will be coffee from Cups Espresso Cafe at the conference. This event is Free and open to the public. Some of the Tools that will be discussed are: Podcasting, Blogging, Ning (Allows you to create your own free social network), Twitter (A mass updater through your PC or SMS texting), Pownce, Plurk, Facebook, Myspace, Google Reader, Viddler, YouTube, and a few others. Each Topic will have a Panel. There will be time to ask questions at the end of each session.